WHO Calls Typhoon's Medical Challenges 'Monumental' : Shots - Health News As horrific as Haiyan has been, the disaster likely won't reach the same level of death and injury as the Indian Ocean tsunami of 2004 or Haiti's 2010 quake, disaster specialists say. Better communication systems in the disaster area are one reason why. 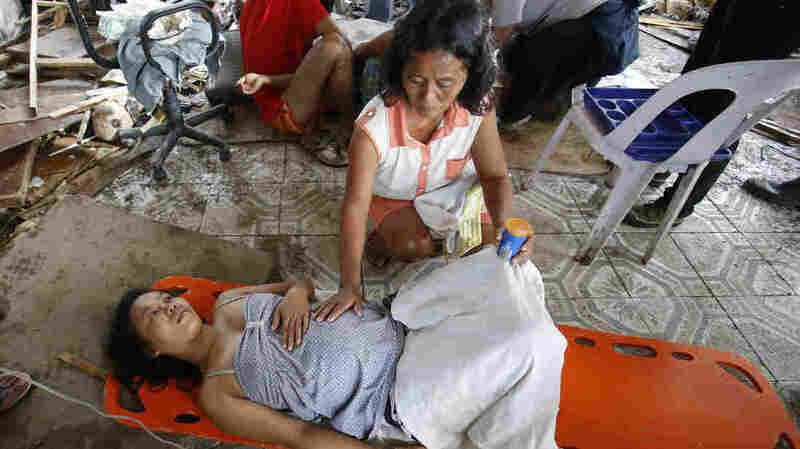 A woman comforts a pregnant relative suffering labor pains at a makeshift birthing clinic in the typhoon-battered city of Tacloban, Philippines, on Monday. Images of the swath of devastation wrought by Typhoon Haiyan in the central Philippines are reminiscent of the tsunami's aftermath a decade ago in Banda Aceh, Indonesia. And indeed, the World Health Organization grades the great typhoon of 2013 as a category 3 disaster — its most severe category. "The scale [of the typhoon's damage] is huge," Dr. Richard Brennan of the World Health Organization tells Shots. "It's monumental. This is one of the biggest emergencies we've dealt with for some time." 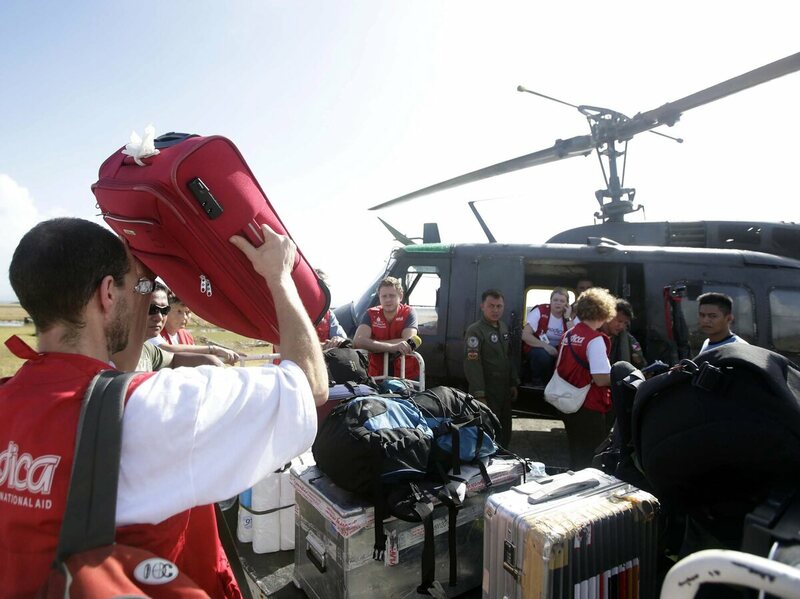 A German medical team prepares to board a military helicopter in the devastated city of Tacloban on Monday. About 9.8 million people affected, according to Philippine estimates. 10,000 or more people killed, based on reports from Philippine government officials in the affected areas. An estimated five major injuries for every death, according to Brennan. Infrastructure for clean water, electricity and medical care destroyed or crippled. 2.5 million people needing emergency food aid. Blocked roads and darkened airports preventing delivery of urgently needed food, water and medical supplies. And yet, as bad as it is, Brennan and others say the tally of killed and injured will fall far short of the 2004 Indian Ocean tsunami, which killed around 230,000 people in 13 countries; or the 316,000 who perished in the Haitian earthquake of 2010. There's little doubt that Typhoon Haiyan (known in the Philippines as Typhoon Yolanda) will go down as one of the deadliest and most destructive weather events ever recorded — a triple whammy of surge, very high winds and torrential rains. Haiyan's sustained winds reached an estimated 190 to 195 mph — more powerful winds than Hurricane Katrina. In Haiyan's wake, the relief effort must deal with an enormous zone of destruction, making it very difficult to get food, water, temporary shelter, and medical supplies and personnel to millions in need. 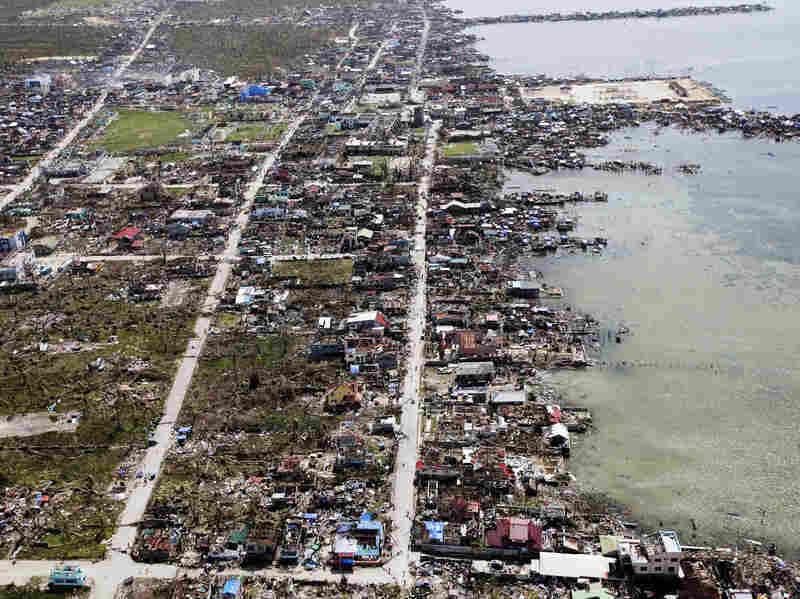 An aerial image taken from a Philippine Air Force helicopter shows the devastation caused by Typhoon Haiyan in Guiuan. "Logistically, I think it will be a more challenging response than the early days of the [Haitian] earthquake," Brennan says. He says the Philippine government has put out a plea for portable field hospitals; Germany and Japan are in the process of deploying them, and Australia will send medical response teams. That's just the beginning of the international medical relief that may be necessary. Brennan says the most immediate health concerns are tetanus and untreated injuries that pose a risk of infection. In the next days and weeks, poor sanitation and overcrowding pose a high risk of diarrheal and respiratory diseases. "Those who have survived this disaster are going to suffer from dehydration, starvation and diseases that have to do with lack of access to clean water," says Dr. Hilarie Cranmer, a disaster medical relief specialist at Massachusetts General Hospital who spent months in post-tsunami Indonesia and responded to the Haitian quake. "The most common problem will be death due to dehydration from diarrhea." That risk is not expected to be from cholera, but from more common pathogens such as E. coli, Cranmer says. "The Philippines has done quite a good job in handling cholera, so I don't anticipate that to be a problem." Later in the recovery period, there's a risk of other infections, such as measles (especially if vaccination campaigns are disrupted), tetanus, rabies, meningitis and even polio. Polio has been eliminated in the Philippines, "but we thought it was eliminated in Syria too," Cranmer tells Shots. And, of course, everyday medical needs and problems will need attention — dialysis patients, heart attack victims, women giving birth. The U.N. Office for the Coordination of Humanitarian Affairs estimates there are 95,270 pregnant women in the typhoon zone; Brennan says 15 percent of those births can be expected to involve complications. But the Philippines has some advantages compared to Indonesia and Haiti. The sprawling archipelago has a better medical and public health infrastructure, Brennan says. A hint of that is readily apparent in the Web postings of the Philippines' National Disaster Risk Reduction and Management Council — situation reports that Cranmer calls "unbelievable" in their detail. "The Philippines is not the lowest of the low," Cranmer says. "In fact, they do quite well — on some indicators better than the States do." In yesterday's report, for instance, you can find pages of known injured and killed Filipinos listed by name — such as a 27-year-old man in Quezon named John Erwin Orriza Capuno, who was killed by a falling tree while riding his motorcycle, or 78-year-old Ofilia Laurella of Capiz, who suffered cardiac arrest "due to panic while evacuating at the height of Typhoon Yolanda." Other logs describe lost and damaged houses, road closures and numbers of displaced people down to the village level. One thing that has improved over the decade since the Indian Ocean tsunami is the technology of post-disaster communications. Satellite phones carry messages initially, and cellphone towers are put back into service as soon as possible. Texting is an important new tool for assessing the situation, locating people and supplies, and coordinating deployments. "We have much better graphics and much better mapping capacity," Brennan says. "We can see much more quickly and concretely where the needs are, where the resources are, and where new incoming teams should be better deployed. "Now, do some needs go unmet for a period of time? Certainly," he adds. "But that's less than it used to be, in large part because we're much better at information management."